Almost everyone you’ll meet here knows the myth of EdakÏ. There was, of course, only one, whose notoriety is proven by a hundred other stories swapped and shared across the Waylands; even now, some vestige of his tribe remains, though greatly reduced in both infamy and number. But the legend that concerns us happened long ago (a more exact date has never been agreed), and a thousand miles east of this crowded coastal bar. Lyle is nineteen – sallow with hunger and almost asleep atop Glory, his horse. It’s been three years since anyone has known his name to say it, a time filled with violent episodes too various to list. (Save one, of some symbolic consequence: Early in his wanderings, at a bar in South Utaba, Lyle watched – unflinching – as a knife fight claimed the lives of all three of its participants, rival traders now slumped in a closed triangle.) He left home a pale boy beset with intimations of adventure, now his neck is armored with black bristles, his shoulders are broader, and his eyes repel the dust. His appetites have only sharpened. Now he rests at Little Yna’s Tavern, day’s earnings wasted on ale brewed from root vegetables, his hat – the spoils of his own, more recent, knife fight – pulled down to the bridge of his nose. The door slams wide; the forest howls and dispenses to the bar a party of four men, rowdy with victory, who order drinks the owner knows will not be paid for, and provoke the dozing piano player to equal their mood with a tune. Only Lyle sees the owner confer with a stranger vanishing out through the back. Drinks are served; a halting melody begins. To all eyes, Lyle sleeps – his eyes were shut, his other senses taut and wire-sharp. A door closes softly. The Raiders now intimidate the owner, then the frightened villagers of the day’s raid. A gifted opportunist, Lyle waits for a peak in the laughter to disappear outside. In the moonlight, a thin figure – the owner’s friend – dives at him with a blade. Lyle parries with his bare arm, trips the attacker and wrests the weapon from knuckles shattered with kicks. Their struggle is brief but loud; soon the four raiders block the light from inside. They lurch closer; passing Lyle to stamp on the man’s neck, then turn him over to inspect his face and recognizing him, or recognizing leastways who his blade was waiting for, kick the cutthroat into lasting paralysis. Only then does their evident leader (if only by merit of his terrible scar, whose appearance depends on the teller), address Lyle directly. That night, the four men became five, drinking until dawn. The cruelest of them, who had first attacked the prone party’s face, was Presta Culé, who spoke in a higher voice than became his stocky build; and beside him Jorge, who giggled and spoke little, and Bren, whose teeth were so black he might have swallowed ink. The scarred man introduced himself with one name pronounced to its fullest advantage: EdakÏ. He laughed when Lyle only nodded. “You must have traveled far,” he said, “to hear that name and not run for the trees.” He went on proudly: Wherever you are in the Waylands, one name means fear, loss, and bloodshed to all who hear it; never have they suffered so dire a plague as that attributed to him. The four men filled Lyle with stories, wilder as the night progressed. But even though he sensed a certain joke hovering in the air above him, Lyle undertook an oath to ride out with them before midnight swung over the sky. The next morning, horses plundered from the stables at daybreak, the five rendezvoused with the rest of EdakÏ’s men – and one woman, a sinewy, expressionless mute with a horse of her own, whose vacant gaze the men seemed to avoid. No introductions were necessary; the group rode north at once and in good spirits. At first, it was hard for Lyle to reconcile this shambolic band with the terror that they claimed to inspire. By night they stole chickens from small forest farms and bickered over whose piece was biggest – unlikely behavior, he thought, for marauders of their magnitude. But there was tell of a larger farmstead only two days’ ride north, where EdakÏ’s men would surely prove their true savagery, and Lyle, his worth in their ranks. The air became hot, the trees thickened and grew slick with botanical drool. Clearings in the forest were scarce. After three days, they heard a dog barking somewhere up ahead. With no more provocation, EdakÏ drew his rusty blade, let loose a bestial shriek and spurred his horse into a gallop. The rest of his party followed suit; a pandemonium erupted into a glade where a mid-sized farming settlement lay empty and smokeless and littered with fifty or so corpses. “We’ve been going in circles,” EdakÏ called out. “Let’s see what we might have left behind.” His men nodded to themselves. The concubine stayed at the forest edge while the rest of the party explored the dead settlement; the lacquered earth, the stables deserted, the blacksmith a burned-out husk. Presta Culé rode in circles, laughing, a pig’s head skewered on the point of his sword. Lyle lifted him, both wincing, up the tavern stair to a warm windowless bedroom just over the bar. The concubine was there to lay her hand on EdakÏ’s forehead. Culé came also, took one look at his bedridden leader and laughed. The raiders quartered there for a week. Lyle brought liquor and cuts of meat three times a day to the injured raider, who devoured them without thanks. EdakÏ’s bonhomie soon gave way to jealousy, impatience, and exacting neediness. Twice he accused Lyle of glancing too long at the mute, now referred to as his bride. She never left his side. For Lyle, it was a vague humiliation to wait on so feeble a man; but he was young, and he could afford to wait. With him to lead the men, he dreamed, idly at first, there would be true glories, hard-won but never forgotten, that would make the Waylands tremble at the rumor of his name. Predictably, Culé had slaughtered every animal in the first few minutes of their bloodlust; now their carcasses had rotted to a poison, and resources ran low. Their leader’s room now reeked of fever and infection. In his heart, EdakÏ knew he had either to wait to be abandoned, or issue the order to desert him. He forged a compromise that depended on their loyalty. Go north, he told Lyle, take the men you need and bring back food and medicine and the allegiance of those towns to my name. Lyle rode out within the hour, followed by all but the mute. Quickly the forest engulfed them; light fell haphazardly or not at all through the shiftless canopy. Presta Culé, who after EdakÏ was the longest serving member of the group, began to bark orders which were followed chiefly because they coincided with what the men were already doing. Lyle ignored this, for now. He was entranced by dreams of power and infamy, and respect won through violent reputation – all, he imagined, within his present grasp. It was he who decided where to camp down – rulings that Culé would loudly reissue once he saw they were heeded. With excitement came discipline; talk was all practical, and they bickered no longer. After three days of uninterrupted forest, they began to pass way-markers that entailed a sizeable village nearby. At the knock of an axe from ahead Lyle raised his hand. They halted, who had also heard it. In a voice that implied, falsely, some experience in the matter, Lyle advised the men to form a half-circle around the glade and, at his signal, to attack from all sides at once. Even Culé saw sense in this conceit and took his place. The signal came; they flooded from the trees and filled the air with wild noises. It is not necessary to record every aspect of the massacre, the images of gore, the hacking and wailing; let us keep as blind to those details as the riders themselves, who followed, as leaves on a river, the deep surging current of instinct. Within minutes the village was an open wound leaking blood, smoke, and survivors in all directions. There were screams: “EdakÏ!” “The forest!” “Get out! Get out!” until the uproar withered and went limp, and the village was theirs. Lyle dismounted, looked around for an ambush and saw Culé burst into a hut from which the last screams were heard. Lyle followed. Inside: a girl – adolescent – her mother pressed to a bed by Culé’s weight. Lyle slew Presta with a stroke – he did not need a second. The girl seemed then to come alive. She whispered a name and then vanished. The eight reconvened at the sodden central pyre where a skinless boar swung messily. “More towns lie to the north,” Lyle told them. He invoked their leader’s name, in whose glory their blades were now dripping. He said, “We ride before dusk.” Their leader himself was forgotten. They unhooked the hog, emptied the village of ale and faced their steeds once more towards the forest. What followed of their northward progress varies with the teller; some say it lasted a month, others five years (which is a recurring figure in our myths). I am anxious not to embellish without basis, even as we drink and darkness, the ideal climate for invention, is climbing in over the sea. EdakÏ’s men were like fire, swift, single-minded and chaotic; they tore through the trees without slowing, some say without sleep. No town was too large to resist them. Their blades flickered red to rust to red again faster than the blink of day and night. In time, Lyle’s gift for strategy eclipsed any doubts the men had held, and because of this, he found himself referred to and even addressed as ‘EdakÏ’ – an error he did nothing to correct. Once or twice, the fastest horse was sent ahead to panic the upcoming town, only to find it empty of all but livestock when he arrived. This strategy, however, denied him the pleasure of witnessing that fear for himself. And with each of his raids, their ranks grew. Many survivors pledged their lives to the men who demolished their homes. (From one of these men Lyle learned the origins of EdakÏ: Brought up the heir to a largely unknown kingdom somewhere in the east, his father, nearing death, was endowed with eternal life by a shaman who sought the king’s favor. Denied of his birth right, the prince took a new name and fled the palace with a dozen of its guards. He would make the realm accept his reign by force, and set out to take what was his. Eight men became fifty or more; the woods resounded with the rumble of their hooves, their epic songs, and the clatter of scabbards on bridles. Lyle’s fiery will, once the reason for his nomadism, now helmed a veritable army. And yet still, one matter gave him pause: the power of EdakÏ’s name was tough to reconcile with the wretch he’d left to perish in that first despoiled hamlet. Nor did the legend of the vengeful prince seem likely to be built on such a man; but then, a legend fills a vacuum where no truth exists, or if that truth is unsatisfying. Now they forged a new legend, overshadowing the first. In a mill-town by a nameless river, the life of a local shaman was spared in exchange for interpreting Lyle’s fortune. The shaman struggled to read his runes, cast them thrice, murmured the words “fever” and “poison” before stating with evident uncertainty that death would fall on Lyle from above. Unsuperstitious and disdainful of gods, Lyle shrugged and kick the man into the water, stones and all. On they rode. A two-hundred-mile stretch fell to blood and ash beneath them, conquered as much by fear as by the skill and might of the men. At the northernmost border where the forest gave out, suddenly, to blank and uncompromising desert, the men reared their mounts and returned South to the last ransacked town, which would serve as both stronghold and trophy of their long campaign. The town of Irma lay as it was left. Although the smoke had thinned, Lyle – it is said – could smell bitterness on the wind that unsettled him. As night fell the note sharpened, and sent eerie dreams among the men, and strange flurries in the fire shaped the faces of those they had slain, then Lyle’s own face, wildly altered. He knew that night he wouldn’t sleep. The gaze of the moon froze the grass and rooves and blackened the forest; a mist of bats took flight in a sudden frenzy; all else lay inert as a boneyard. At once there came a harsh inhuman cry, so loud and so unnatural they were uncertain if it came from within or without. Now darkness bled from every point of the tree-line, accompanied by thunder, and again that battle-horn replaced the air, and figures whose shrieks could now be heard; some two hundred (others say two thousand) armed marauders rose from nowhere to hang the camp in a swift black noose. Some were gutted where they slept under the stars. The more domesticated raiders woke to find their huts aflame and death rampaging at them fast as darkness after light. 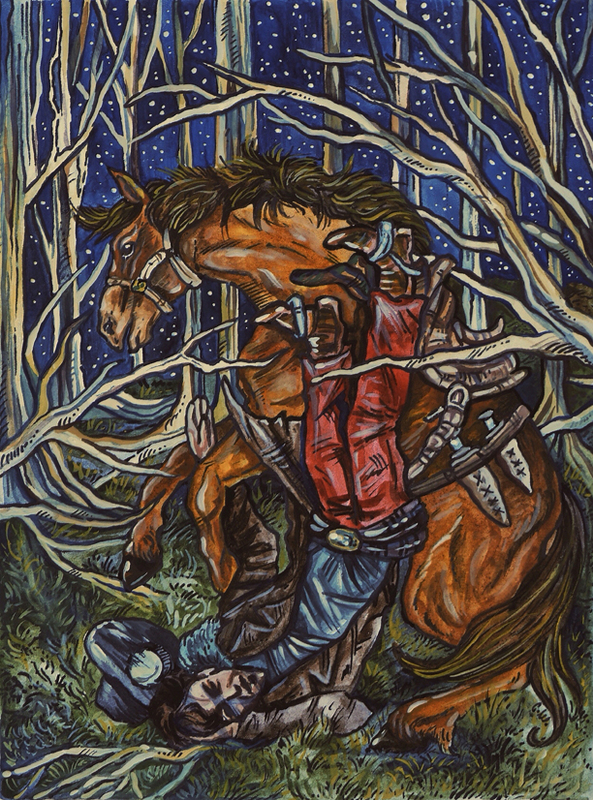 Lyle snatched a bridle from mid-flight, mounted crudely, turned the horse with desperate strength toward a chink he had glimpsed in the oncoming horde, lashed – then swung his sword and with more luck than skill upset a rider – shocked by his mortality – and galloped into the black forest. Jagged branches rent his clothes; the earth sent up roots to topple him. His horse had found him; he clung on by the neck. He did not imagine the snarling from over his shoulder. With the blazing town still heating his back, Glory faltered, its hind leg slashed. Lyle was tossed to the floor in one pinwheeling second; scrabbled, rose and found his face mere inches from a hostile blade. Time in its horizontal hurry seemed to rocket skyward; again he fell in a fresh assessment of his folly. The hooves behind him slowed; a man dismounted, without haste. Lyle made no reply. The sword-tip marked his throat. Something stirred in the canopy. A sword fell like the verdict of a god, impaling the prince through the eye of his crown – he dropped. Someone landed next to him, her dark hair matted with the dirt of many weeks. First she retrieved her sword. Then she plunged the point into the earth and with great deliberation, so there could be no doubt as to her meaning, knelt before Lyle and once more uttered his name. It was she who had survived Presta Culé. Some say it was the mute, her loyalties revised since the loss of her master. Sadly, it wouldn’t matter. Behind them, the cries of battle gave way to victorious cheers. Lyle in command of both armies, under one name; Lyle crucified by those loyal to the prince; Lyle’s savior taking up EdakÏ’s crown… our legend ignores these poetic opportunities. By cruel fate, the prince’s sword was alloyed with the resin of the Caler tree – its brief intrusion into Lyle’s blood was sufficient to kill him, after sending him delirious. A detail, no doubt apocryphal, is added here: Before he died, Lyle saw himself reflected in a stream and did not know his face, nor the origin of its distinctive scar. He died alongside his horse. Now dawn is here or will be soon, and I have no moral to satisfy you – only the fate of a name. Who took it next is unknown – some monikers require only the courage to adopt them. I am grateful to you for listening – and that you haven’t asked for mine. Saint Urban and the Peril of the Predatory Pontiff or Habemus Papam! Theirs was an epic battle between Good and Evil…nothing less. The Church’s secret defender, a man whose faith had summoned him back from the shores of death to serve and protect in times of crisis. The aggressor: a dark-clad figure made up of shadows and hatred, blood and fangs. His form constantly shifted, never entirely solid as though held together only by sheer will. This was not their first battle. But the old holy warrior feared it might be their last.